Papunya Tula: Genesis and Genius is the first major exhibition of Aboriginal art tracing the phenomena of the Papunya Tula movement from the early 1970s to the present. This exhibition is part of the Gallery's contribution to the Sydney 2000 Olympic Arts Festival. The Western Desert art movement, which originated in the small community of Papunya, some 250kms west of Alice Springs, has placed Aboriginal art - and, some would say, Australian art - firmly in the international arena. It is appropriate to acknowledge and celebrate this contribution to Australian art at a time when the world's attention will be drawn to Sydney. Comprising approximately 150 paintings, Papunya Tula: Genesis and Genius will chart the development of this exceptional art movement through its most outstanding works. This story will be told by the period's leading artists who will each be represented by their key paintings. The paintings in this exhibition have been drawn from major public collections as well as private collections within Australia, Canada, England, Germany, Holland and the United States of America. Papunya Tula Artists was established by a small group of Aboriginal artists in 1971, following the work of school teacher Geoffrey Bardon in encouraging the children at Papunya to create art using the motifs and symbols of their own traditions. This initiative was seized upon by the senior men of the community who firstly painted a mural of the local Honey Ant Dreaming on the school wall and then began making small paintings of their Tjukurrpa (ancestral stories) on any available surface. However, their efforts were initially ignored by the market and the movement experienced difficult times in its first decade. 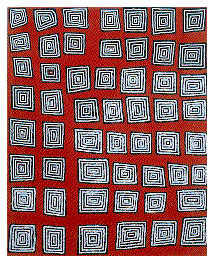 Yet, for the artists, numbering less than thirty at the time, painting was a relief from the hardship and cultural deprivation imposed by living in Papunya, a centralised government settlement established as a marshalling point for Aboriginal people displaced from their traditional lands, including the Pintupi, Anmatyerre, Luritja and Warlpiri. Over the next two decades, through the artists' perseverance, the paintings evolved from the experimental, gestural and potent expressions of Tjukurrpa to larger, more ambitious and sophisticated paintings on canvas. As more and more artists became involved, each drawing on the symbols and icons idiosyncratic to their particular language groups, individual artists began to emerge as major creative forces. Following the outstation movement of the late 1970s and early 1980s, many of the artists moved to their traditional homelands, to country as far west as Kintore and Kiwirrkura. In the 1980s the movement flourished and other desert communities such as Utopia, Yuendumu and Balgo also began to produce works of art for an outside audience. From the earliest works of the period through to the present day, the paintings by Papunya Tula artists have maintained a presence that has distinguished them from other painters of the Western Desert. In recent times, women artists have asserted themselves as independent and accomplished artists. A younger generation of artists have a strong voice, reaffirming the traditions of their elders and ensuring the continuance of their heritage into the twenty-first century. Papunya Tula: Genesis and Genius is presented in association with Papunya Tula Artists Pty Ltd, Alice Springs. To celebrate the exhibition, Papunya Tula artists will create a specially commissioned ceremonial sand sculpture; and the exhibition will be accompanied by a comprehensive full colour book. Papunya Tula: Genesis and Genius is curated by Hetti Perkins, Curator of Aboriginal and Torres Strait Islander Art at the Art Gallery of New South Wales. � Aboriginal Artists Agency Ltd.